One of the benefits for video poker players of opting to play at Microgaming software powered sites is that when it comes to the range of variety of video poker games on offer you will be very hard pressed to find any other casino game software company offering as many different variants of video poker at Microgaming does! One video poker game variant we just know many players are going to enjoy playing is the Aces and Eight video poker game, what makes this game appealing yet very different from any other variant of video poker you can play online is its pay table. The pay table on this game has been designed in such a way that the payouts you can achieve when you have formed a winning hand combination containing four Aces or four of the 8 cards are much higher in value than on other variants. The best way you can play off every single hand you do decide to play on the Aces and Eights video poker game variant is by placing five coins on each hand, for that way you get to take advantage of the enhanced jackpot hand combination which has been boosted in value way higher than when you play one to four coins per hand. 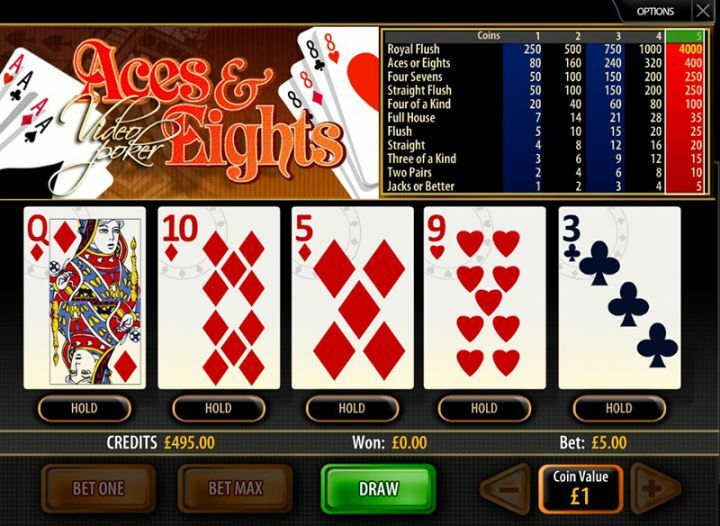 Also for you to get the best winning chances when playing he Aces and Eights video poker game online when you launch the game you should click on the options tab button and then make sure the auto hold option setting is activated and switched on. When you turn on the auto hold option every new initial five card hand that is dealt out to you will see the game automatically holding the best cards for you on that hand in regards to the perfect playing strategy for this game. So by turning on the auto hold option you will never have to guess which cards are the best ones to hold on that initial hand and will never make any costly playing errors! The reason why Microgaming’s large range of different video poker games is so popular with many players is down to the pay tables attached to each of their video poker game variants. If you master the art of playing any of the games perfectly then over the long term you will find much more of the cash you wager is going to be returned to you as winning payouts. When playing the single hand Aces and Eights video poker game variant you are going to find with perfect play the payout percentage is going to be a very huge and very appealing 99.09%! Make sure you compare that payout percentage with the RTP’s offered on different casino game designers version of this game for by doing so you will find that Microgaming’s variant is by far and away the very best paying one available and as such should be the one you actively track down and get stuck into playing online for real money!